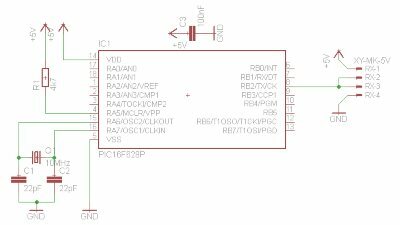 Codec for PT2262 and PT2272 RC chips | Enide! 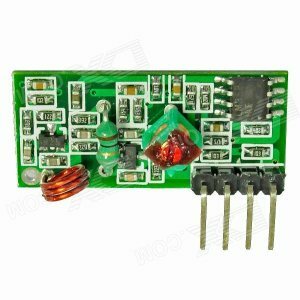 On this page you'll find an experimental codec that simulates both PT2272 decoder and PT2262 encoder chips. 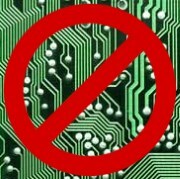 These two chips are commonly found in many inexpensive garage door openers and are of fixed code type. They provide a configuration word of 12 ternary digits which means that there are 312 = 531441 different code combinations. This is by no means a secure solution since the code transmitted by these chips never changes and all it takes to duplicate one of these remote controllers is to listen for the transmission and then replay it. There are more secure solutions using rolling code techniques where the code changes every time the remote controller transmits. Rolling code solutions are more complex to implement and require constant synchronization between transmitter and receiver. 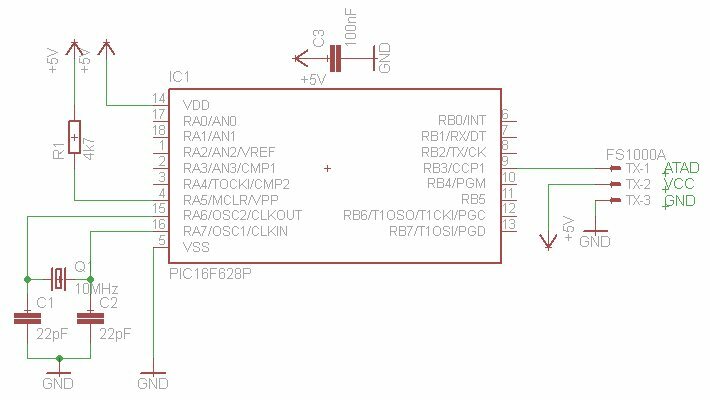 The schematics presented below are based on a PIC 16F628 because both encoder and decoder firmwares were developed on a 16F628 but it shouldn't be hard to port to other PICs. The encoder schematic is on the left and the decoder on the right. The output pin of the encoder is on RB3/CCP1 pin 9 and the input pin for the decoder is on RB4 pin 10. The signal on these pins is not modulated with any RF carrier. 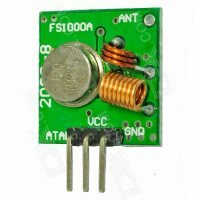 The RF signal is generated by a small FS1000A 433MHz ASK transmitter module connected to the output pin RB3/CCP1. And the receiver pin RB4 is connected to a XY-MK-5V ASK receiver. They can be bought at almost every online shop selling Arduino parts. This is an experimental driver software to use in your own projects. It was developed on a white breadboard with lots of wires! README.txt - a file you should read! 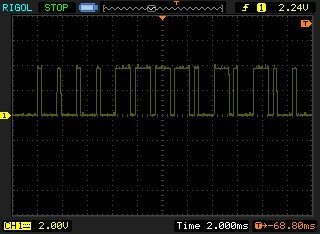 Currently both encoder and decoder modules run with a fixed 10KHz clock rate when the PIC is driven with a 10MHz crystal oscillator. 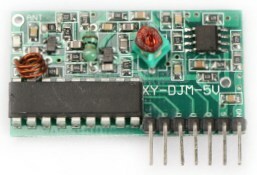 One thing that distinguishes PT2262 and PT2272 from other remote controller chips like MM53200 is the fact that they don't use binary digits (bits) for the 12 bits configuration word. While on a MM53200 those 12 digits can be 0 or 1, on the PT2262 and PT2272 the configuration digits can be 0, 1 and F (float). Using ternary digits for the configuration word increases the number of possible combinations from 212 = 4096 to 312 = 531441 as stated above in the overview. The use of ternary digits means that each digits can not be stored in a single bit, i.e. a single bit is not enough to represent 3 states, just 2. We need to use more than 1 bit for each digit. On the next section is an example of the encoding the ternary digits using nibbles instead of bits! // is it still transmitting? To encode the 6 ternary digits "1 0 F 1 F 0" of address the array should have the following 3 bytes: [0x10, 0x21, 0x20] where 'F' is represented by the value 2, '1' is represented by the value 1 and '0' by 0. Yes there are some unused bits on every nibble but this a simple solution that works and doesn't complicate the code that much. On the transmitter main example program both address and data are being read from the EEPROM. This is not mandatory but since the address part is usually fixed I thought of providing it as an example. The data can, of course, be defined based on the value of several push buttons connected to the PIC. The output of the encoder module can be seen on these screenshots. On the left is a single code word and on the right is the same code word zoomed in. The 2 important functions are pt2272_poll and pt2272_rx, the former tests if a valid frame has been received and the latter retrieves the 12 ternary digits only when a valid frame has been received. Calling pt2272_rx without a valid frame does nothing and returns false. 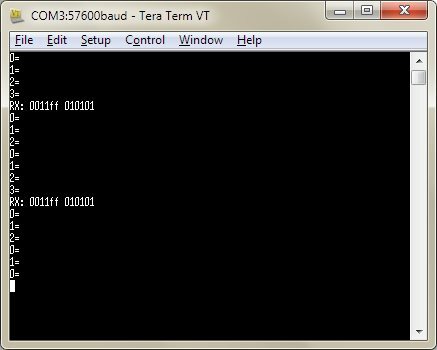 Like on the transmitter module, both address and data parameters should be arrays with 3 bytes. The 12 ternary digits received will be placed one per nibble on each array. The main program prints every correctly decoded frames to the serial port. To build a valid/complete transmission, 4 code words must be transmitted. Each code word consists of a sequence of 12 ternary digits encoded as indicated above, including a final sync short pulse with a period of 128 * Talfa. 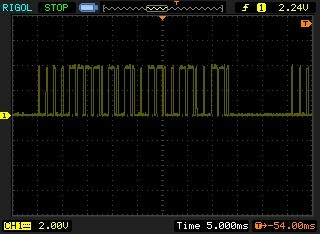 The decoder uses timer0 in 8 bit mode with a 1:16 prescaler and the interrupt on change feature of port B. The overflow condition is detected by the timer0 interrupt that only fires at this situation. It then finalizes the decoding process and resets the state machine to prepare it for the next frame. 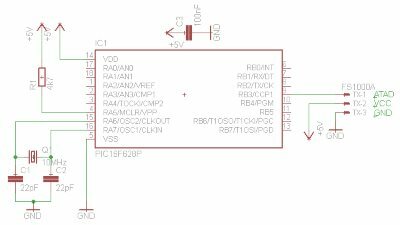 If you plan to use this codec in a circuit with another FOSC, please take time to review the macros in both pt2262.c and pt2272.c to make sure there are no overflows. 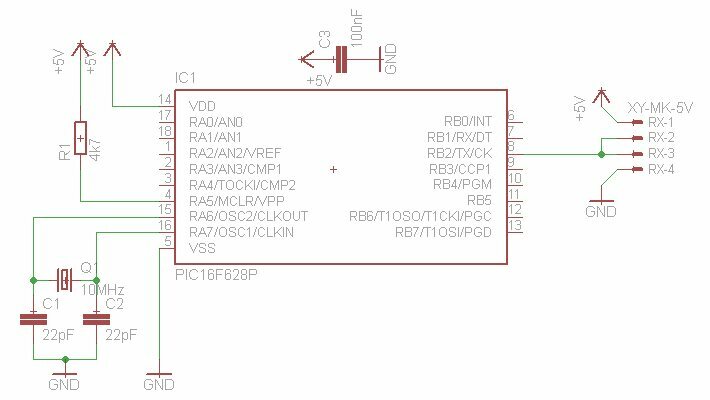 The same thing must be done if you need another clock rate on the decoder or encoder.